They might seem like a tiny obstacle for a 500-ton plane, but insects crushed by a flying aircraft reduce speed and increase fuel costs. NASA’s ‘bug team’ has been looking for a solution for years, and has homed in on the perfect insect repellent coating. "Laminar [streamlined flow] aircraft wings are designed to be aerodynamically efficient,"said Mia Siochi, senior materials scientist at NASA's Langley Research Center in Hampton, Virginia. "If you have bugs accumulating, it causes the airflow to trip from smooth or laminar to turbulent, causing additional drag. An aircraft that's designed to have laminar wings flying long distance can save five to six percent in fuel usage. Surprisingly, all you need are little bugs that trip the flow and you lose part of this benefit." 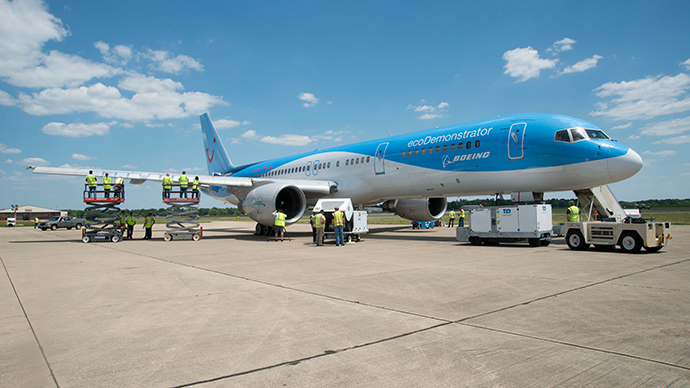 Since 2009 NASA has been operating its Environmentally Responsible Aviation (ERA) Project to try and improve the efficiency of civilian planes in conjunction with plane manufacturer Boeing, which has provided its experimental ecoDemonstrator 757 for live experiments. The team recently flew down to Shreveport, Louisiana, a city renowned for its massive bug population. There it performed 15 test sessions – consisting of multiple landings and takeoffs to increase contact of low-flying bugs – sampling five different wing coatings, selected from 200 developed by scientists. "One of the five coating/surface combinations showed especially promising results," said Fay Collier, ERA project manager, in a statement published by NASA. "There still is a lot of research to be done, but early data indicated one coating had about a 40 percent reduction in bug counts and residue compared to a control surface mounted next to it." The most promising material was based on the ‘lotus effect,’ first noticed centuries ago in the flower, which seemed to simply shake off water and dirt as if by magic. "When you look at a lotus leaf under the microscope the reason water doesn't stick to it is because it has these rough features that are pointy," said Siochi. "When liquid sits on the microscopically-rough leaf surface, the surface tension keeps it from spreading out, so it rolls off. We're trying to use that principle in combination with chemistry to prevent bugs from sticking." So-called hydrophobic materials using this principle have been emerging over the past several decades, and have had been suggested for use in products from clothes to paint to smartphone surfaces, though actual adoption remains relatively rare. Now, NASA and Boeing – supported by the US Department of Transportation, and a team of university scientists – are working on finding a material that is not only effective in principle, but can be adopted for industrial use. The coating needs to be resistant to the harsh atmospheric environment, not damage the plane surface and require only occasional re-application. This flight series is only one of dozens of experiments by ERA to develop lighter materials, reduce noise and create better aerodynamic designs – an April test showed that vertical tails on jumbo jets should be reduced by 17 percent to save fuel. NASA says it will make the research public and available to the industry, while any proprietary technology will stay with Boeing.